Celebrate with a beautiful bright and cheery arrangement of sunflowers, accented with golden valley asters and raffia in a chic glass vase. 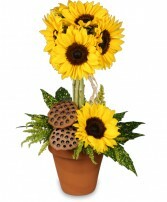 As shown is smallest size with 6 sunflowers in a one-sided view, we will arrange in an all-around design. 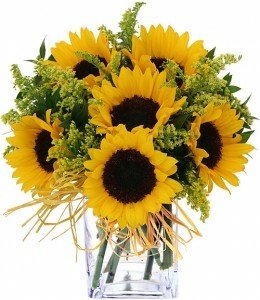 This overflowing basket of yellow brings sunshine and warmth to any home. A seasonal mix of our freshest yellow blooms in a grapevine basket, topped with an everlasting butterfly.